With all of the recent bad weather and impassable roads it was the perfect time to try out Jaguar’s new elegant SUV – the E-Pace. The design of the E-Pace is more or less a scaled-down version of the F-Pace and is not electric, as the name might suggest. The E-Pace is a superb looking SUV and for me is the attribute that will be largely down to its very likely success – I think Jaguar has got the design absolutely right. Jaguar’s manor house drawing room inspired design is long gone and the design, both inside and out, is super-dynamic and contemporary – yet it hasn’t lost any of the luxury feel. In a world where modern cars are criticised for being more samey than ever, often manufacturers seek identity by introducing stand-out but sometimes ugly and superfluous additions. The new Jaguar range is obviously Jaguar yet there are no unnecessary features to mark this – just sharp, inoffensive and seemingly not ‘marmite’ as everyone I spoke to about it shared the same opinion as I. The E-Pace version I tested was finished in Indus Silver Metallic which appears as a subtle grey and suited it perfectly – it makes it look a little more understated but equally proud. 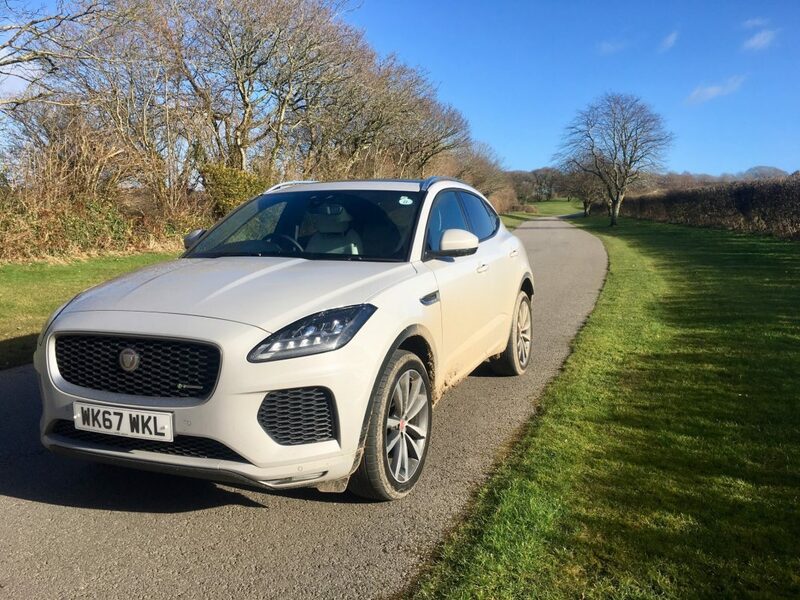 The E-Pace is based on the Evoque, though not in its entirety – as such you can get front wheel drive and four wheel drive options – I tested the four wheel drive version. 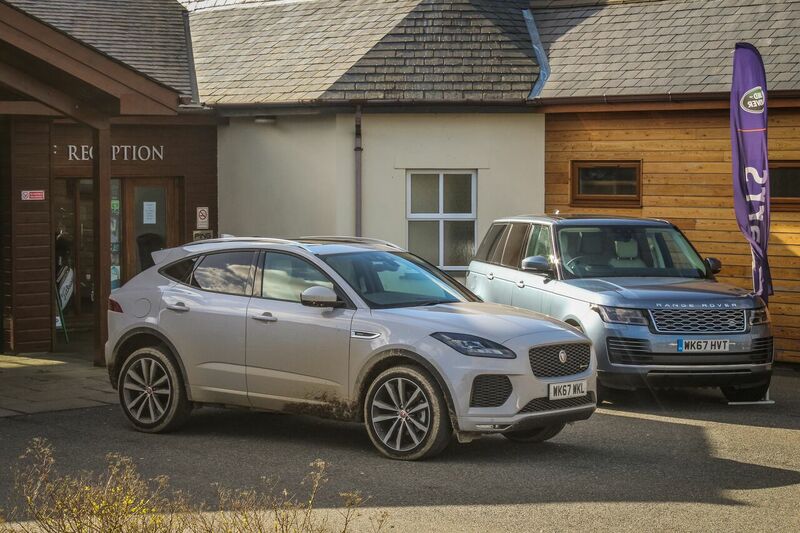 Coinciding with Carrs Jaguar ride and drive event, which took place at Lanhydrock Hotel and Golf Club, I was able to go off road on a marked-out circuit with all variants of climbs and terrain to really gauge its capabilities. It looks too well-groomed for this, however beneath is a well-setup and capable machine. The traction was notably superb whilst the ground clearance, though limited, was sufficient for some pretty treacherous ground. It is amazing how these tall heavy SUVs handle so well and the E-Pace is no exception, feeling potent and nimble on tarmac (in Dynamic mode) with barely any body-roll whilst not compromising ride quality. There are a number of engines to choose from, which comprise of 150bhp, 180bhp and 240bhp diesels and 249bhp and 300bhp petrol engines. I’d recommend pushing the boat out and going for a 240bhp diesel – it’s a premium vehicle and therefore should have the power and response to go with this (though the 180 I tested was punchy enough, I certainly would avoid the 150) together with a claimed circa 45mpg average. However contrary to this advice of mine you need to be careful as the price rises sharply with added spec. The competition in this sector is very strong, with tough opposition coming from every which direction, but I think the E-Pace is firmly in the centre of it. It has class leading styling and the substance to back it up.